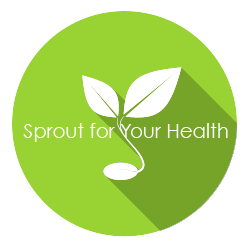 Take a generous handful (2 ounces) Alfalfa sprouts and lightly toss in oil and vinegar dressing. Make a sprout nest in a small salad bowl. Place egg in the nest and decorate. Garnish with a “carrot”: shape cream cheese into carrot form, sprinkle with paprika, use a parsley sprig for the top. 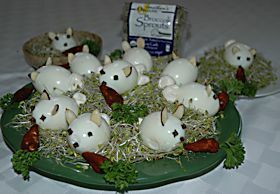 If you want a whole patch, use a whole package of sprouts and assemble on a platter.